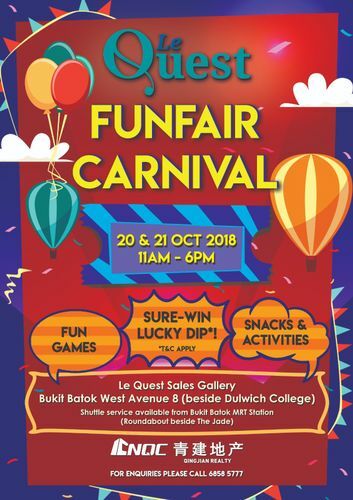 Join Qingjian Realty (South Pacific) Group Pte Ltd (Qingjian Realty) for some Halloween fun at the Le Quest Family Carnival! On 20 and 21 October 2018, Saturday and Sunday, watch the Le Quest Sales Gallery expand to offer an array of activities and treats for the whole family. Be entertained by old school carnival games like giant snake & ladder and jenga. Partake in exciting sports activities like archery, arcade basketball and soccer shootout. Children can bring home balloon sculptures and their own art and craft projects. Hungry? A slew of snack stations serving popcorn, candyfloss, ice cream and hotdogs will satisfy stomachs. Don’t miss out on a sure-win lucky dip to sweeten the visit! Visitors can look forward to walking away with vouchers or souvenirs. Enjoy a fun-filled day with your family at the Le Quest Family Carnival!